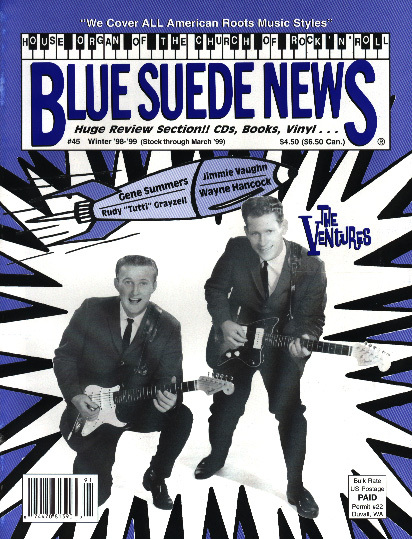 Blue Suede News #45: the Ventures, Gene Summers, Rudy Grayzell, Groovy Joe Poovey, Russell Scott and the Red Hots, Wayne Hancock, Greaseball, Rockabilly, Surf, Blues, '50s Rock'n'Roll! Issue #45 - Winter 1998/1999 - OUT OF PRINT - REPRINT AVAILABLE - Scroll down to order!! digital (pdf) version also available for $7.50! Click here for PDF please note which issue you're ordering with the payment! You'll see issue #45, but can order any 68 page issues from that same page, issues #35 through #56 (#56 is 60 pages). Blue Suede News #45 (Winter '98/'99) has 68 pages with a slick cover. It features an extensive article about '60s Northwest super instrumental group the Ventures ­ masters on their Fender (and later Mosrite) guitars with lots of hits. There is also a story about '50s Texas Rockabilly artists Gene Summers and Rudy "Tutti" Grayzell and Groovey Joe Poovey. Current west coast roots music band Russell Scott & The Red Hots is featured and there is a review about a show blues giant Jimmie Vaughan gave at the Pier in Seattle. Wayne Hancock, the Hillbilly top cat is interviewed. Also included is an article about the Greaseball in San Francisco and an excellent blues photo layout from the Lifetime achievement awards and 1998 Blues hall of fame induction at the house of Blues in Los Angeles by renown blues photographer Jef Jaisun, featuring Ruth Brown, Ray Charles and Bobby Blue Bland. This issue can also be ordered in pdf form (along with any issue #35 - #116 - #35 thru #56 are $7.50, order below) and e-mailed anywhere in the world for the same price! E-mail to inquire for that price (about half what it costs us to print and ship a reprint copy in the U.S.). Send $15.00 (U.S. or $17.00 Canada), or $20.00 (Outside the U.S. and Canada) and note which issue you're buying - to Blue Suede News, Box 25, Duvall, WA 98019-0025 U.S.A.